Total Sales at Rs. 952 crores in Q2FY18 compared to Rs.942 crores in Q2FY17. EBIT declined by 65% to Rs. 36 crores in Q2FY18 compared to Rs. 102 crores in Q2FY17. EBIT Margin stood at 3.7% in Q2FY18 vis-à-vis 10.9% in Q2FY17. Cash generated from Operations reached to Rs. 623 Crore in H1FY18 and PAT toRs. 198.8 crores. Debt declined by around Rs. 380 crores in H1FY18. Targeted decline for FY18 is Rs. 450 crores, which is expected to be met easily. Long Term Debt came down by Rs. 359 Crore in H1FY18, including High Cost Debt of INR 163 Cr. Interest Cost came down by 17% Y-o-Y in H1FY18. The Interest Coverage ratio stands at 7.2x in H1FY18. The Credit ratings for the Long-Term Bank Facilities have moved higher to AA- from A+ and the Short-Term Bank Facilities to A1+ from A1. 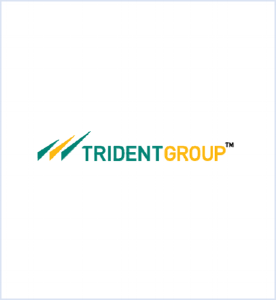 Dun and Bradstreet upgraded business rating of Trident Ltd from 5A2 to 5A1, which is the highest achievable level and indicates minimal risk and high degree of credit worthiness. Widened spreads between spot and forward prices of cotton and yarn prices impacted profitability adversely, but have now been stabilized. Volume Sales in BathLinendipped by 11% Q-o-Q due to uneven vendor procurement cycle and change in product mix. US market share for BathLinen is about 12%-13%. 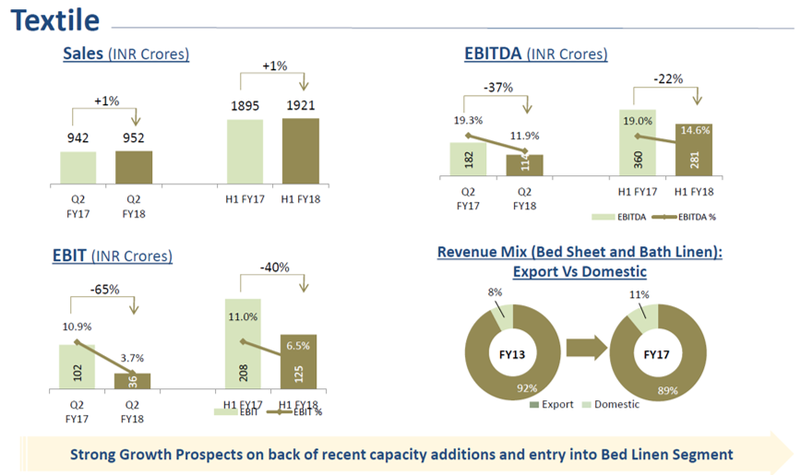 Bed Sheet is not yet at break-even point; expected to reach it in H2FY18. For Bed Linen, the realizations have improved by 6% Q-o-Q. Volume de-growth in Towel is about 12%. For Towel, half-year to half-year realizations improvement is around 2%-3%. Overall, the result is 9%-10% decline in Towel segment. Proportion of captive yarn consumed is 40% in Q2FY18. Captive Consumption of Yarn volume increased by 24.6% in H1FY18 compared to H1FY17, bringing down product price risks. In domestic business, revenues grew at a healthy rate of 24% Y-o-Y to Rs. 157 crores in H1FY18 due to presence in around 450 Multi-Brand Outlets and e-commerce platforms. Adverse impact of GSTwas witnessed in Q1 and Q2, leading to decline in Sales by 7% on Y-o-Y to Rs. 204 crores in Q2FY18 compared to Rs. 218 crores in Q2FY17. However, Utilization has improved to 87% in Q2FY18 from 83% in Q1FY18. Q-o-Q price decline in Paper segment is around 4%-5%. EBIT has increased by 76% to Rs. 76 crores Q-o-Q while EBITDA Margin stood at a healthy rate of 48%. The reasons are higher efficiencies and locational advantage (within 40-50 km radius) for Wheat Straw (main component of raw material) in Punjab. However, sustainable margins are 36% to 40%. ROSL has been reduced from 3.9% to about 1.9%. Duty drawback is now kept at 2% along with the input credit. Another Bed and Bath business incentive is MEIS which is around 2%. On an overall basis, its impact to is 2% on the Bed & BathLinen margin. Going forward, this 2% impact will be only 1% on EBITDA on the company has a whole. An increase in efficiency and volumes is expected to offset this impact and ensure that margins to continue to grow. Current hedging position is about 30% to 40% of theestimated export revenue. There was a hedging gain in this quarter.